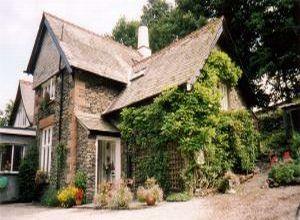 Bowfell Cottage Bed & BreakfastBowfell Cottage is admirably situated fronting a private drive just off A5074, Lyth Valley Road, above eastern shore of the lake about 1 mile south of Bowness Bay and set in 0.5 acre of wooded ground and gardens. Bowfell Cottage is admirably situated fronting a private drive just off A5074, Lyth Valley Road, above eastern shore of the lake about 1 mile south of Bowness Bay and set in 0.5 acre of wooded ground and gardens. Excellent parking. Open-garden aspect. Pinewood furnishing, solid wood floor. Fully-tiled shower in seperate en suite room with facilities. Lovely south-west facing room with pleasant garden aspect. Contains 1 double bed and 1 single bed. Z-type bed available to accommodate a family of 4. Bathroom adjacent. Smaller room but nicely furnished with pleasant rural aspect. Bathroom adjacent. From Bowness centre, opposite St Martin's church, take A5074, Kendal Road for 1.25 miles. Middle Entrance Drive is on the right-hand side; entrance to property is 100yds down lane. Public transport to Windermere station and we will collect from there. The lady who runs this place was extremely accommodating and she cooked a great breakfast! You were a lovely family, thank you.